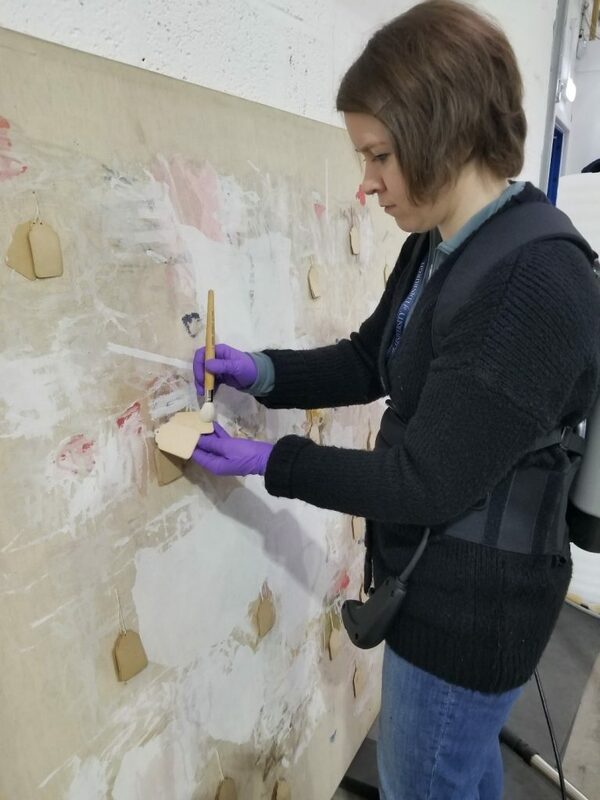 In order to safely store these paintings and easily transport them, the surface dirt needed to be removed. We had special portable vacuum cleaners, or “vac-packs”, that we could strap to our backs. The vac-packs had adjustable nozzles for more detailed cleaning, and we used goat hair brushes for more delicate areas. Microfibre cloths were used to wipe down glass and other smooth surfaces. A team from Constantine Fine Art Logistics, or a “Constanteam”, took care of the heavy lifting. They brought the artworks to us for cleaning then attached fixings in preparation for mounting on the roller racking. We worked well with the Constanteam and managed to clean and move over one thousand paintings into the new store. We were an efficient team of dust busters, working our way through all the paintings over a three-week period. Fortunately, we encountered only a few unwelcome (squatting?) spiders and moths. It was immensely satisfying to watch the dirt disappear from the paintings. Due to the wide range of brushes we had, we were able to get into the tight corners of the homemade frames the students had made for their artworks, as well as reach way above our heads to clean the massive billboard-sized paintings that were brought through the doors. 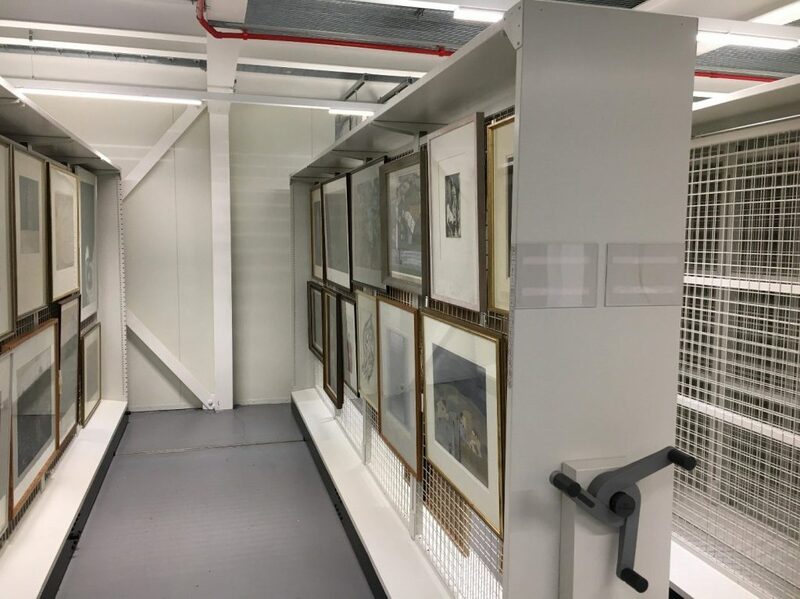 We came across some interesting pieces, such as one painting that had cream-coloured identification tags threaded through the canvas in sets of four or five, which proved difficult to clean. There were also several pieces that were unusually shaped. 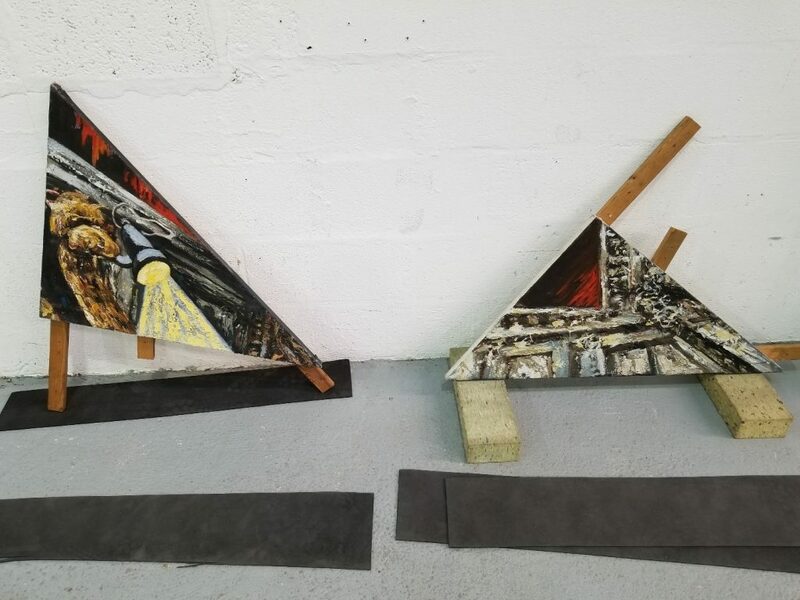 In particular, two were constructed as triangles, a testament to the creativity of the art students. 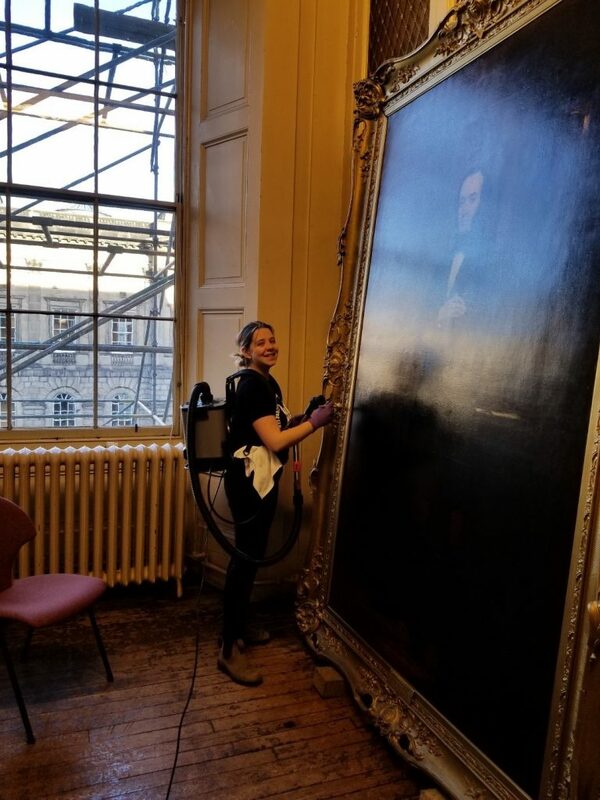 In addition to this cleaning of student artwork, we also were given the opportunity to dust-bust some extremely large paintings located at the University’s Old College. These paintings were in stark contrast to the UCF’s collection, due to their gilt frames and their lack of creatively shaped canvases. These traditionally rectangular portraits were super-sized and proved difficult to manoeuvre, requiring six of the Constanteam-members to remove them from the walls. Although these were difficult to clean, our handy hand-held vac-packs and some step ladders allowed us to reach for the stars and bust those dust bunnies from the top of the frames. So next time you find yourself in a dusty situation, who you gonna call? Dustbusters! 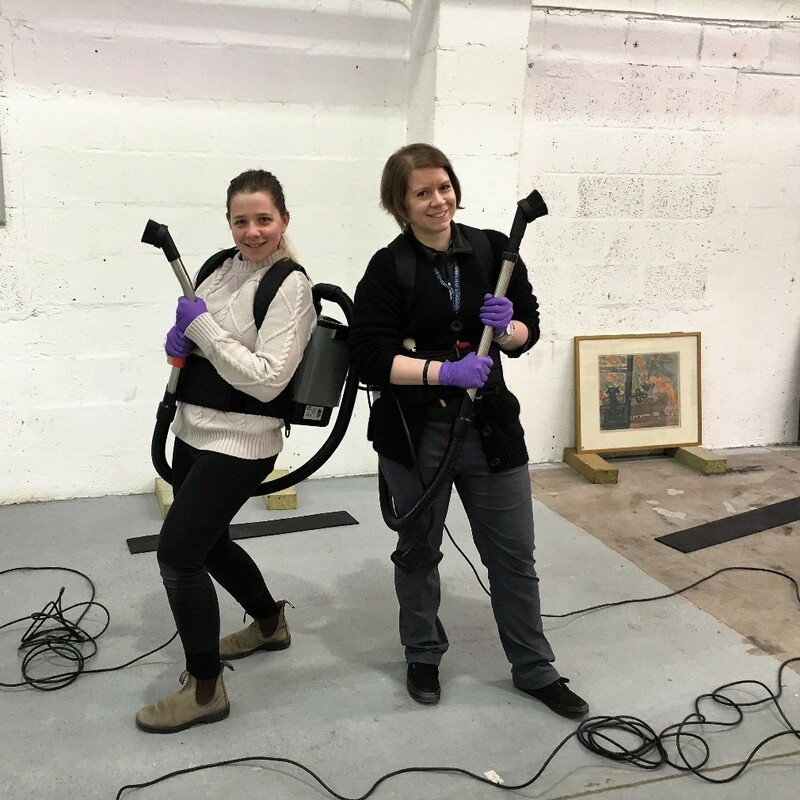 This entry was posted in Projects and tagged museum vacuum cleaners, surface cleaning, University Collection Facility by conservation. Bookmark the permalink.